Tattoo artists on Kho Phi Phi in Thailand. On this small island, tattoo artists are the celebrities, often dripping from head to toe in permanent ink. Notice the MS-13 gang tattoo on the fellow on the right’s face. Tae, a stoic tattoo artist of Phi Phi. What happens in Thailand stays in Thailand — except permanent ink. Brennon Hittel, a Canadian backpacker from Medicine Hat, Alberta knows this all too well. 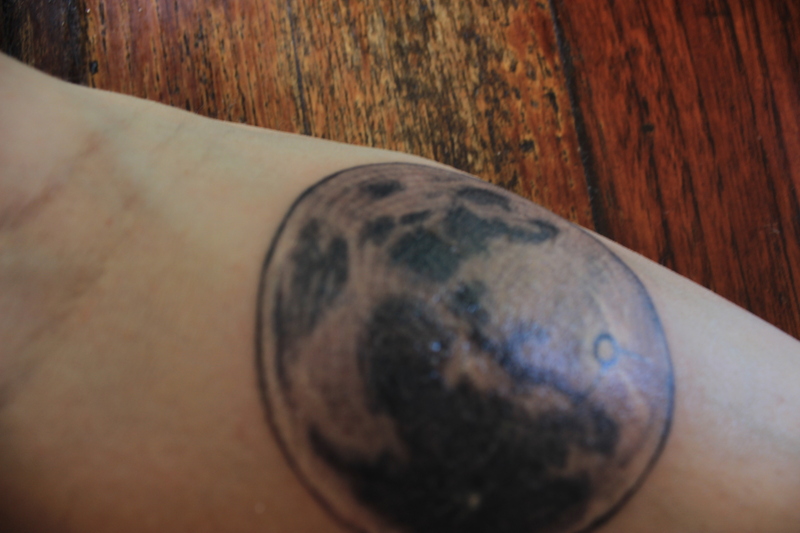 Brennon spontaneously inked a full moon on his forearm at 3 a.m. following a night of clubbing on the beaches of Koh Phi Phi last week. When the sun rose at 6 a.m. he had more craters on his arm than Neil Armstrong had ever laid eyes upon. Phi Phi is a hotspot for tattoo tourism. Every year, thousands of foreigners flock to the island’s tattoo parlors to etch enduring memories onto their skin. “Everyone come [to] get tattoo here,” says Puanggun Pornsuwan, owner of F Bamboo Tattoo in Phi Phi. Mr. M, one of F Bamboo’s tattoo artists near the beaches of Phi Phi. Puanggun, 38, a scuba diver in the mornings and tattooist by night, has been inking tourists up for upwards of 10 years. For people like Puanggun and those in Phi Phi’s ink industry, tattooing is a sacred art. Most artists’ bodies are draped in ink — from head to toe. 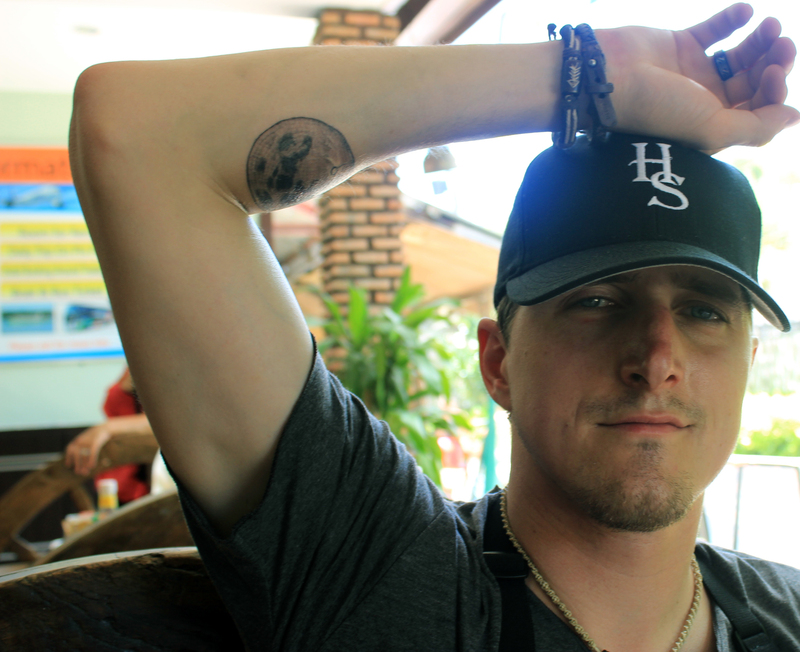 Like the cult comedy Hangover 2 — also suitably filmed in Thailand — liquid courage is responsible for Brennon’s new tattoo. 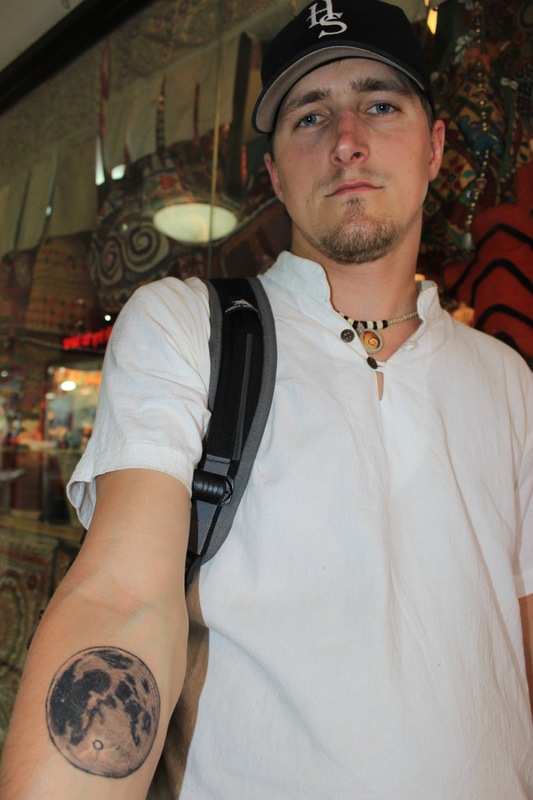 Backpacker Brennon Hittel displays the bamboo tattoo of a moon he received in Phi Phi a few days prior. His skin is nearly fully healed here. Brennon of New Moon. Brennon’s permanent memory of Thailand, a token of his insanity on a night defined by drunken debauchery. “Lots of drinking [inspired me to do this]. It seemed like that was the time to do it,” says Brennon, 27, who also has a machine tattoo on his back and another under his lip. 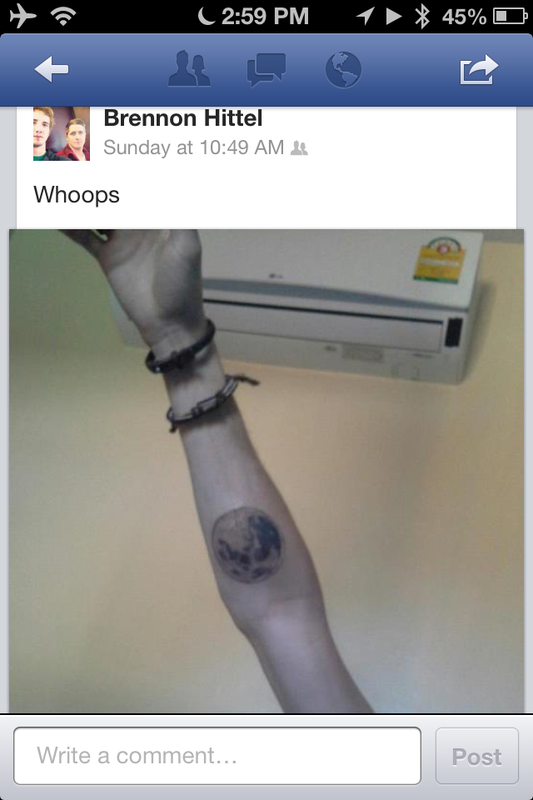 Brennon posted a photo of his tattooed moon on Facebook soon after. Reactions varied. Aptly titled, “Whoops,” the post caused a social media frenzy. “Everybody thinks I have AIDS now,” he jokes. “My mom is probably going to freak out but she’s just happy I’m alive and all my friends think I’m crazy,” Brennon says. Contrary to health concerns some people might have, tattooing here appears to be harmless. There’s a special ingredient that makes this is a special place to get inked up; and it boils down to an ancient Thai tradition. Bamboo tattooing — not conventional machine inking — is the medium here. “[It’s] different than machine,” says Puanggun. Fine needles are attached to a thin stick of bamboo rather than a machine. A client of a Phi Phi tattoo artist calmly watches as he receives some fresh ink. Bamboo tattooing is less painful, retains colour better & allows the recipient of ink more freedom in the days following the procedure. Unlike conventional machine tattooing — where drink inking, as well as swimming or sun tanning are discouraged — bamboo tattooing allows the recipient a little more freedom. Bamboo tattooing is suited for sloppy drunken travelers who may not be sober under the needle. The technique also retains the tattoo’s vibrancy over time and caters to those who want to spend time in the sun and water the next day. The healing process is typically between three and five days. “You can swim the day after. Everyone who comes here they want to be in sun or go swimming,” adds Puanggun. The method punctures but doesn’t tear skin and is less painful than machine tattooing, too. “It was way less painful for bamboo,” says Brennon. Dazed & confused the morning after the deed. Brennon was still in awe, shock & pain from the night before when he decided to ink a full moon on his forearm between 3-6 a.m. on Koh Phi Phi. He drunkenly paid his artist 6,000 extra baht. At a cost of 3,500 baht ($120 CDN), Brennon thought he was in for a steal of a deal. In his haze of belligerence, he accidentally paid 9,000 ($300 CDN) baht instead. “When they stole my 6,000 Baht that wasn’t cool,” he laments. Like a werewolf, Phi Phi transformed Brennon into a different sort of beast at night: not quite animal, but not quite human either. The tropical island often has this effect. His ink moon symbolizes his sometimes reckless personality. “I find the moon to be representative of a crazy side I have when I drink,” Brennon says. Tattoo artists like Puanggun frequently have problems with intoxicated travelers. He prefers to book his customers when they’re sober. Although this standard definitely varies on Phi Phi, Puanggun will only ink incoherent clients if they’re not completely out to lunch. “Some come very drunk. We like to book them before and then they go to get drunk and come to do it. But we cannot do if they’re too much drunk and want to do tattoo. We say we don’t deal with drunk people,” Puanggun explains. Incoherent ink. The iconic Facebook post that launched a controversial discussion amongst Brennon’s friends & family in Canada. People were critical to say the least. In Thailand, enough baht can get you whatever your heart desires, and I’m sure some artists turn a blind eye to this apparent issue if your wallet’s big enough. Sweet jebus! Next time Brennan takes a trip abroad I’m sending him a good ol’ paper journal to record his experiences. the one of the guy with the web piercing in his ear is my boyfriend, one of the best artists on the island so proud of him! Haha it is funny! I was there on that night with my friends and boyfriends (he s on a first picture). Brennon was realu excited to get full moon tattoo heheh. Btw didnt think someone from tattooshop stole his money, more probably he lost it. Lmfao, wtf is with the thai with the MS-13 tattoo?!?! Does he even know what MS-13 is or did he go looking for “badass gang tattooos” on google. You can’t be thai, or asian for that matter and be MS-13.